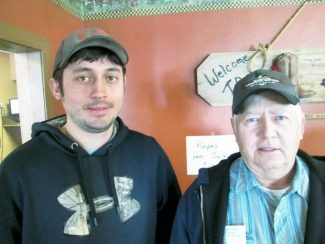 Ryan and Larry Schweigert, Gregory, South Dakota, bought 4 bulls. Auctioneer Chisum Peterson, Chamberlain, South Dakota, with Len Odenbach, Burke, South Dakota. 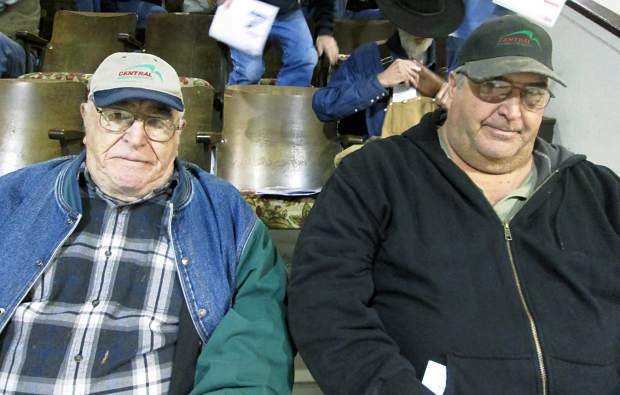 Gant Angus and Polled Herefords, owned by Dennis and Mark Gant and their families, once again rolled out the hospitality for their annual two year old bull sale at Platte Angus. These families continue to carry on the tradition of good livestock that has been in their family for over 100 years. 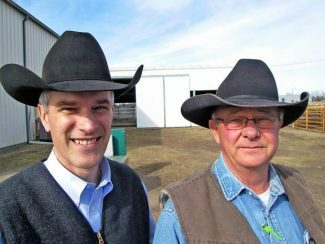 Their ranch is two miles west of Geddes, South Dakota. This was a big, stout set of two-year-old bulls that were well-grown and looked to be very strong and athletic. The Gant cattle carry a strong guarantee, and are kept free of charge until April, and then delivered for free. Many repeat buyers were on the seats to make this a very successful sale for the Gant families. There was especially good demand on the Hereford bulls, and this enthusiasm carried over into the Angus bulls. Top selling bull of the day was the Lot 3 Hereford bull, going to Dennis Beckmann from White Lake, South Dakota, for $7,750. He was Gant Revolution 338B, a son of Bar JZ Rebellion 474X, and out of a Precise bred cow. He had EPDs of CE 0.3, BW 3.9, WW 52, YW 69, MILK 21, M&G 47, CEM 1.7, SC 0.6, and REA of 0.43. His weaning weight ratio was 114, along with a yearling weight ratio of 123. The top selling Angus bull was Lot 26, selling for $7,500 to Craig Swanson, Chamberlain, South Dakota. This son of the Wagonhammer bull, WAR Upgrade Y155 U161, was out of a Right Time bred dam. He was a recommended heifer bull with a 72 pound birth weight, and a weaning weight of 710 pounds to go with a 1,300 pound yearling weight. His EPDs were BW 1.8, WW 50, YW 90, and MILK 27. Randy Muhs from Mount Vernon, South Dakota, selected the Lot 2 Hereford bull at $7,250. He was a Rebellion son who was out of a Yankee bred dam. With an 89 pound birth weight, he posted a weaning weight ratio of 112. His EPDs were BW 2.2, WW 47, YW 76, and MILK 24. The Lot 30 Angus bull sold for $7,000 to J&M Farms from Geddes, South Dakota. He was a son of WAR Upgrade, and out of a daughter of Connealy Danny Boy. He had EPDs of BW 1, WW 50, YW 95, and MILK 22. The Robertson Stock Farm from Wagner, South Dakota, long time buyer of Gant bulls, bought Lots 12 and 13, both Hereford bulls, selling for $5,750 and $5,500. They were both sons of JDH 15T Wrangler 25W ET and out of Prospector bred dams. Larry Schweigert from Gregory, South Dakota, topped his purchases with Lot 32 at $6500. This Angus bull was an Upgrade son who was out of an Alliance daughter. He had weaned at 750 pounds. The Lot 49 Angus bull brought $6,500 from Kelly Neugebauer from Dimock, South Dakota. He was out of WAR Final Answer, and out of a daughter of Bon View new Design 1407. This was a very good sale for one of the nicest agricultural families in South Dakota!